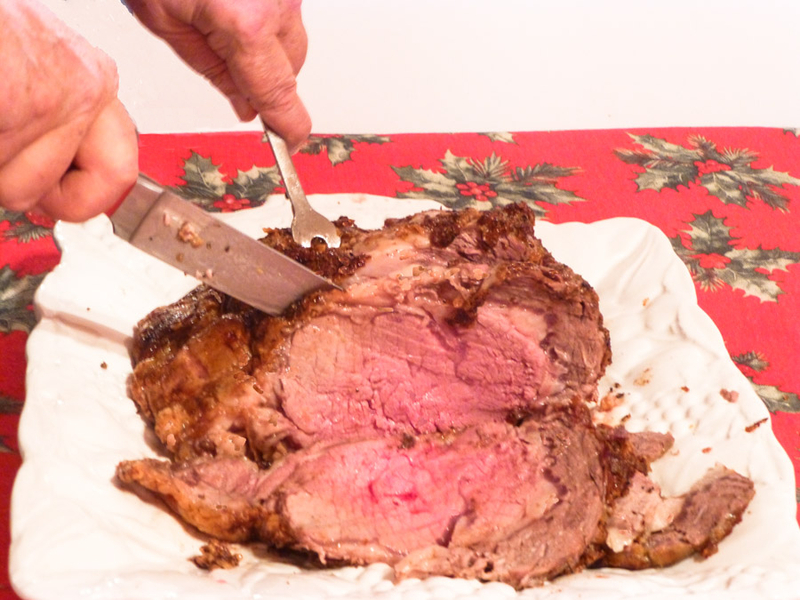 We splurge here for our Christmas Eve dinner with a big beefy prime grade of beef for our rib roast, roasted to mouthwatering perfection for the occasion. This would be great for any special day ~ succulent prime rib. This is, hands down, my favorite meat, the rarer, the better. I followed the advice from a butcher at Orchard Prime Meats, our superb butcher shop, starting the roast in a very hot oven to sear the outer surface for a crusty exterior, and finishing at a lower temperature. An accurate meat thermometer is a necessity. It’s easy to cook, easier than roasting a turkey, and turns out as good as any 5-star steak restaurant could do it! Allow meat to come to room temperature. Pat roast dry with a paper towel. Make a rub of remaining ingredients and rub seasonings all over roast. Place in roasting pan, fat side up. Cook roast for 15 minutes to sear outer surface. Slice meat away from ribs, cutting along the bones. Here's wishing you all a very Merry Christmas! You remember those cookies, from way back when, Snickerdoodles? 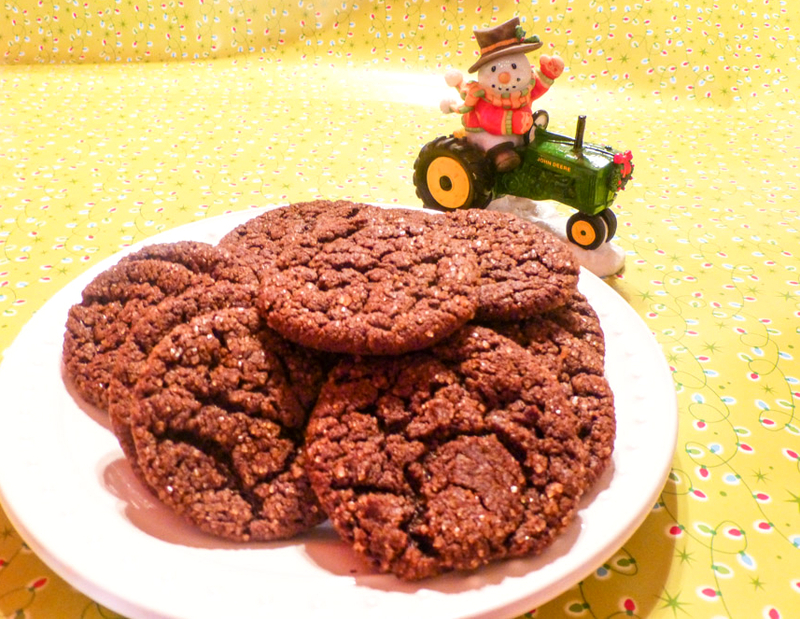 Well, here’s the chocolate version for all you chocoholic cookie lovers! 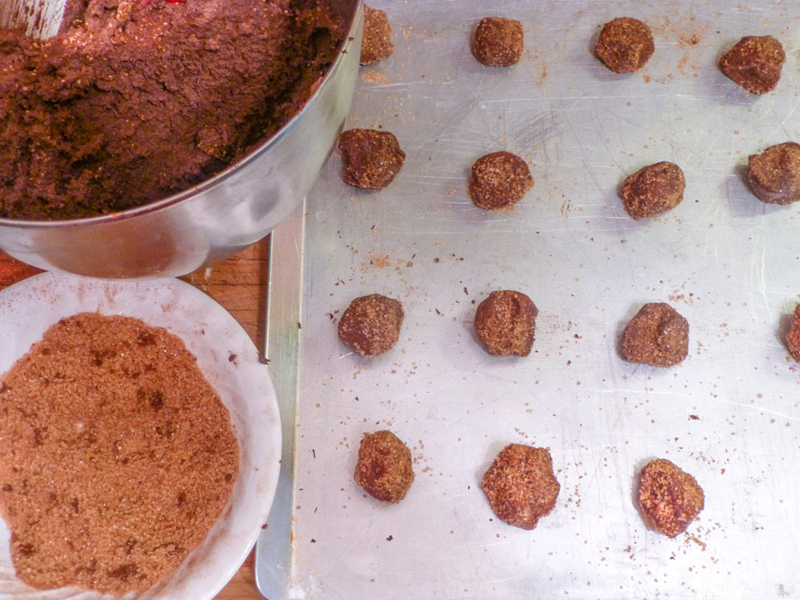 These simple little cookies go overboard with good flavors ~ cinnamon and chocolate. They’re a dark little chewy cookie with a sparkle. They start out with butter and sugar, like the traditional snickerdoodle, with a little cream of tartar for the soft perfect texture. I slightly adapted this Food Network Magazine recipe, by using Hershey’s Special Dark Cocoa for the best ever-chocolate taste, and Saigon Cinnamon for its sweet, especially rich, cinnamon flavor. Don’t over-mix the ingredients; combine them just well enough to produce the classic snickerdoodle chewiness. Roll in cinnamon sugar to finish them off. This is a scrumptious twist on the traditional recipe. They’re chocolaty without being overly sweet; they have a sugary crunchy crust, and an almost cake-like center ~ with a sparkle to boot. Try them, they’ll melt in your mouth! Position racks in the upper and lower thirds of the oven. Whisk flour, cocoa powder, cream of tartar, baking soda and salt in a medium bowl. Beat butter granulated sugar and brown sugar in a large bowl with a mixer on medium speed until creamy, about 2 minutes. Increase the speed to medium high and beat until fluffy, about 2 more minutes. Beat in egg and vanilla. Reduce the mixer speed to low and beat in the flour mixture until just combined. Combine the sanding sugar and cinnamon in a small shallow bowl. Form heaping teaspoonfuls of dough into balls with damp hands. Toss in in the cinnamon sugar to coat. Arrange about 2-inches apart on 2 baking sheets. Bake until cookies are set around the edge, 8 to 9 minutes. Let cool 2 minutes on the baking sheets, then transfer to a rack to cool completely. Many of you ~ like my family ~ go bananas for anything chocolate. 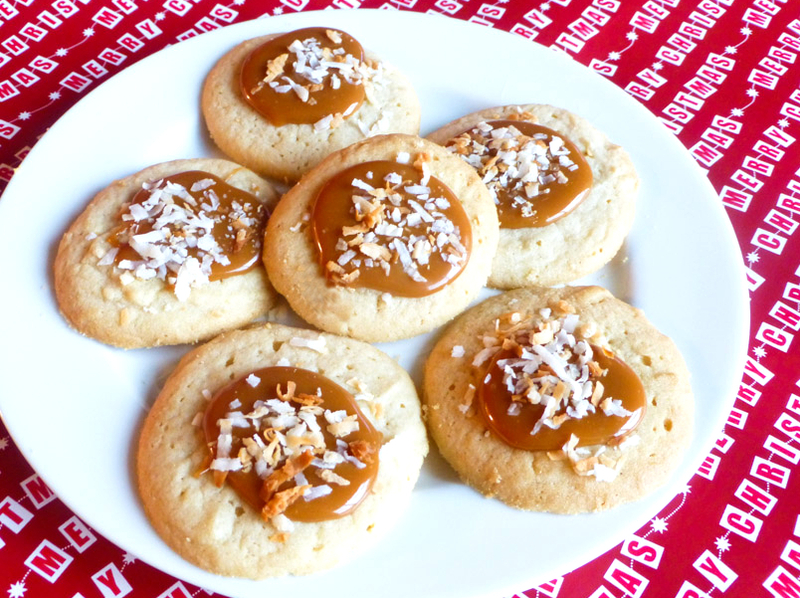 Not me ~ I go bananas for caramel and coconut! These rich cookies are crunchy on the outside and creamy, maybe a little chewy toward the center, a perfect combination to me. The recipe belongs to Better Homes and Gardens, and I liked it so much, I doubled it: all the more to share. They’re easy cookies to make and good for the season. In a large mixing bowl, beat shortening and butter with electric mixer on medium speed for 30 seconds. Add both sugars, baking powder, salt and baking soda. Beat until combined, scraping sides of bowl occasionally. Beat in egg, the 2 tablespoons of milk, and vanilla until combined. Beat in as much of the flour as you can with the mixer. And stir in any remaining flour. 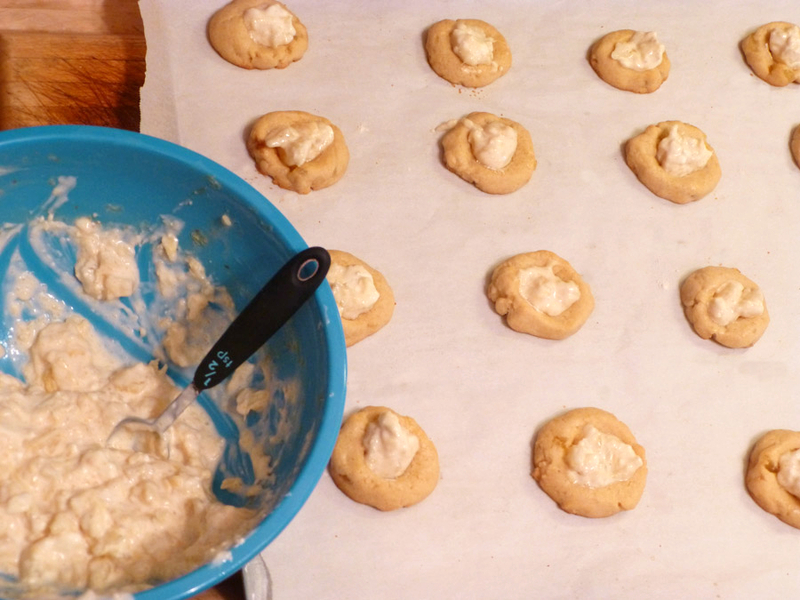 Drop dough by level measuring tablespoons 2-inches apart onto prepared cookie sheet. Bake for 9 minutes, until edges are slightly browned. Meanwhile, in a bowl, microwave caramels and the ¼ cup milk on high until melted and smooth, stirring every 30 seconds. 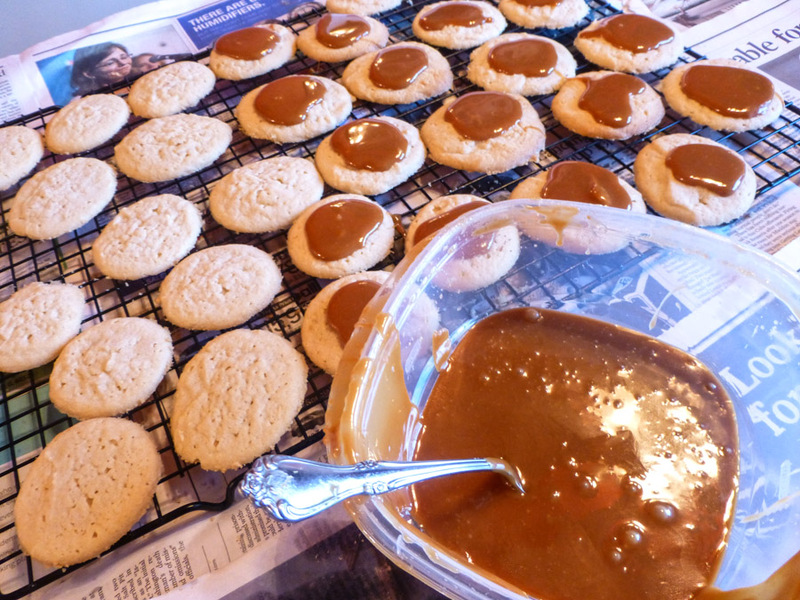 Spoon caramel mixture onto cookies. *I use Werther’s Baking Caramels, they’re wrapped in wax paper and easy to use for baking! When I bite into one of these little gems, it’s like capturing the essence of Hawaii, my favorite destination! It’s a buttery sugary treat with a creamy filling nesting in the thumbprint. It’s a cookie that is filled with the delicious flavor of pineapple. This recipe, from Food Network Magazine, can easily be doubled. To mellow the sweetness, the filling is blended with cream cheese. 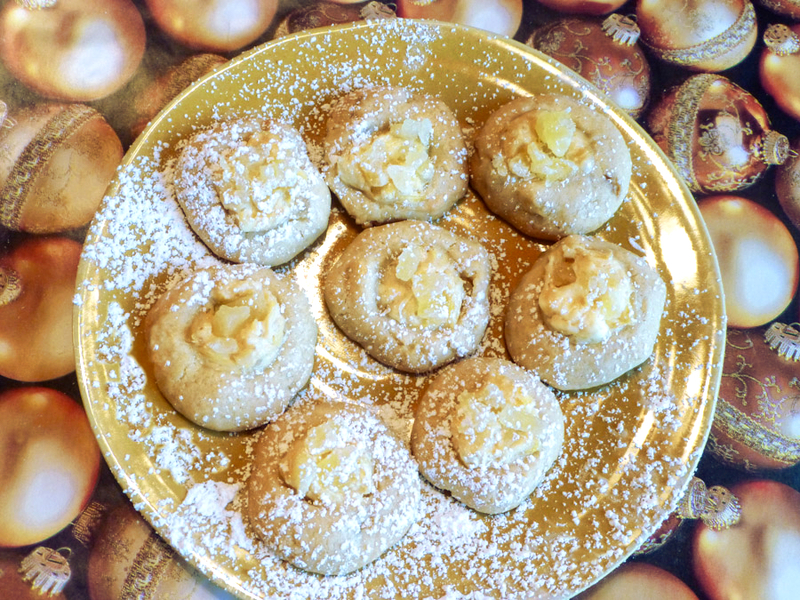 Then the cookie is finished with a few bits of dried pineapple clustered in the cream cheese filling. Whisk flour baking powder and salt in a medium bowl. Beat butter, brown sugar and 1/3 cup granulated sugar in a large bowl with a mixer on medium speed until light and fluffy, about 3 minutes. Beat in the egg, then the lemon juice. Reduce mixer speed to medium low; mix in dried pineapple, the the flour mixture until combined. Cover and refrigerate until firm, about 30 minutes. Meanwhile, combine crushed pineapple, cream cheese, the remaining 2 teaspoons granulated sugar, vanilla and lemon zest in a bowl with a rubber spatula, breaking up any large pineapple pieces. Refrigerate until slightly firm, at least 30 minutes. 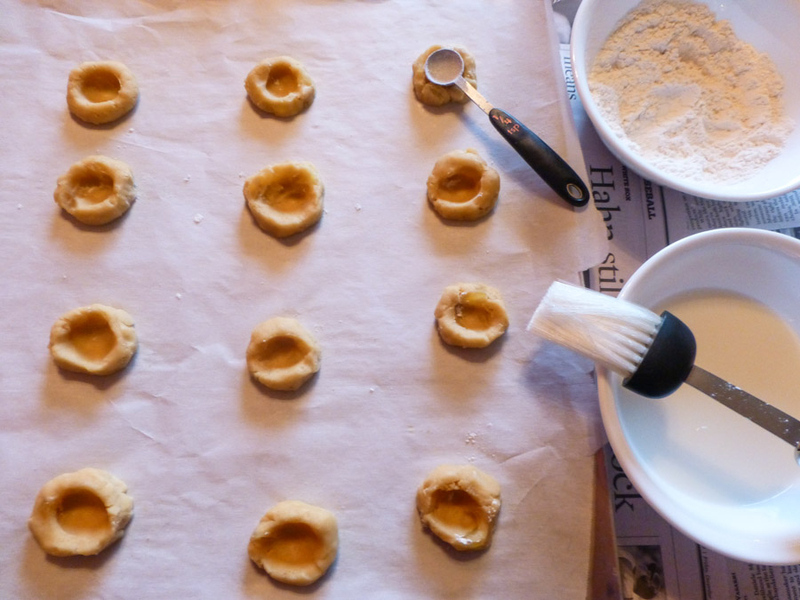 Roll dough into 1-inch balls; arrange 2” apart on baking sheets. Indent each with the back of a floured ¼ teaspoon measuring spoon. Bake until cookies are slightly puffed, 10-12 minutes. Remove from oven and re-indent. Return to oven until lightly browned, 6-8 more minutes. Let cool 5 minutes on baking sheets; transfer to racks to cool completely. Rich and Creamy Buckeye Candy ~ OHIO! 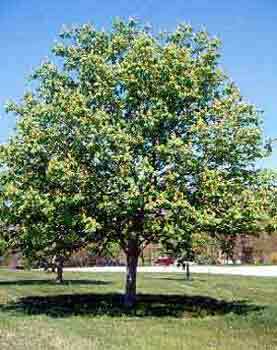 I’m a Buckeye at heart ~ was born in Ohio, lived there through my early years; my extended family still lives there. 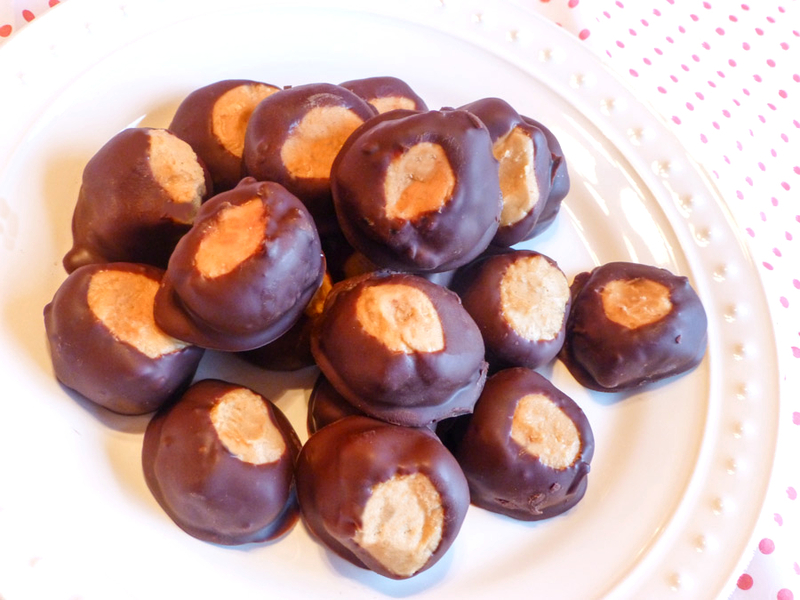 It’s almost a shame ~ I’ve never made Buckeye Candy until now. There are about a zillion recipes over the Internet for this delicious confection; this one belongs to Jif. It’s not a candy that is made often in this neck of the woods, so that makes it even more of a treat with it’s taste similar to Reese’s Peanut Butter Cups. 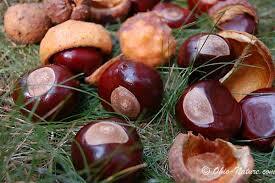 The buckeyes are dipped in chocolate in a manner to duplicate the nut from the Buckeye tree, the state tree of Ohio. They have a smooth peanut butter filling that is coated with rich semi-sweet chocolate. It’s an easy recipe, which you will probably want to double like I do. Maybe these sweet little candies will bring a person good luck, just like the real Buckeyes do! Combine peanut butter, butter, vanilla and salt in large bowl. Beat with an electric mixer on LOW until blended. Add 2 cups powdered sugar, beating until blended. Beat in additional powdered sugar until mixture, when shaped into a ball, will stay on a toothpick. Place chocolate chips and shortening in microwave-safe bowl. Microwave on medium for 30 seconds, stir. Repeat until mixture is smooth. Reheat as needed while coating peanut butter balls. Insert toothpick in peanut butter ball. 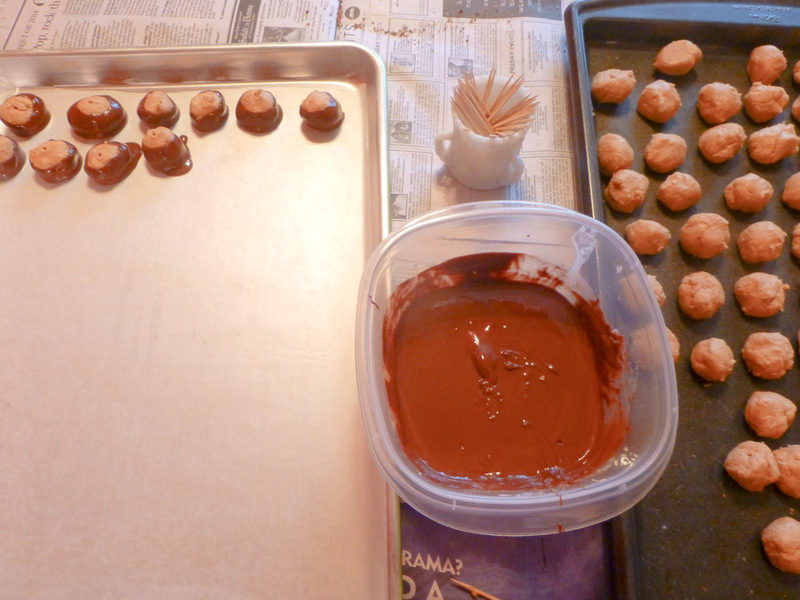 Dip ¾ of ball into chocolate, leaving top uncovered to resemble a buckeye; remove excess. Place on wax paper-lined try. Remove toothpick and smooth over holes. Pam’s note: The chocolate adheres well when the peanut butter balls are VERY COLD and the chocolate is VERY HOT. Dip them immediately; don’t let them sweat, as the chocolate won’t stick. They’re easy to make, and sooo good!